Prof. Hossam Haick from the Technion Wolfson Faculty of Chemical Engineering received the European Commission “2018 Innovation Award: Most Innovative Project” on behalf of the SniffPhone Project. The award was presented in Lisbon on November 21, at the European Forum of Electronic Components and Systems (EFECS). The SniffPhone Project, established and coordinated by Prof. Hossam Haick with the support of the Horizon 2020 ICT-02a-2014 Program, is a collaboration of nine partners from six countries. SniffPhone is a compact handheld device for early diagnosis of cancer. The high-accuracy device is low-cost, non-invasive, and easy to use. The SniffPhone project integrates micro- and nano-technologies to create an autonomous system that can be connected to smart devices and can analyze disease markers from exhaled breath. The breath sample is tested via a miniaturized array of highly sensitive nanosensors and processed by a microfluidic lab-on-a-chip. The electrical signals are transferred via the smart device to a server. Statistical pattern recognition is applied to the received data and a clinical report including the screening results is sent back to the attending medical professional. SniffPhone represents a new concept in healthcare, taking into consideration ethical aspects. SniffPhone has an unparalleled advantage over traditional screening methods and provides a simple and cost-effective alternative for medical professionals. The core technology, containing innovative nanosensors for breath analysis, was developed by the Technion team. Nanosensors for defining the breathing protocol were developed by NanoVation-GS Ltd. – a Technion spin-off company. The micropump was developed by Cellix in Ireland, fluidics by Microfluidic ChipShop in Germany, and the cloud platform by VTT in Finland. The clinical studies were carried out at the University of Latvia in Riga, with further testing and technical experimentation done in Austria at the University of Innsbruck. Siemens has taken part in the testing and validation phase of the SniffPhone project and conducted usability studies. JLM Innovation, Germany provides system integration, the device software, the SniffPhone App and algorithms for the measurement system. 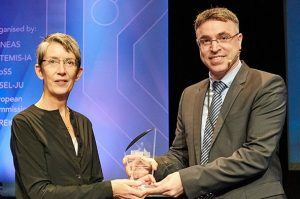 The 2018 Innovation Award was presented on the 21st of November in Lisbon, at the European Forum for Electronic Components and System (EFECS) in the presence of EU leadership and the Israeli Ambassador in Portugal Rafi Gamzo; Dr. Jan Mitrovics – CEO JLM Innovation GmbH and SniffPhone partner was called to join Prof. Haick in receiving the award. 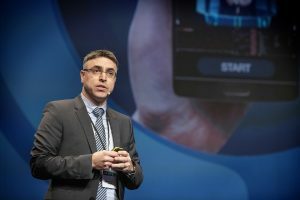 Prof. Haick serves as a consultant to several spin-off companies from his laboratories at Technion, and leads three EU consortia, with numerous collaborators in, academia and the health system. He holds numerous patents and was named one of the World’s 35 Innovators Under the age of 35 (MIT, 2008); and more recently one of the world’s 100 leading innovators. He has won many honors, including “Knight in the Order of Academic Palms” granted by the French Government; the Humboldt Award, the Bill and Melinda Gates Foundation Award; and the Hilda and Hershel Rich Technion Innovation Award.